Discover 6 fun farming activities that allow kids of all ages to learn more about the country life and food production in the farm. 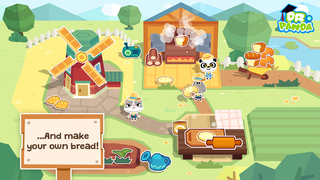 Kids will start exploring the process in the wheat farm by watering and harvesting the crop, then grinding the wheat into the flour at the mill. Then the baker will knead the flour into a dough. Finally, the dough is baked in the oven and sent to Dr.Panda. Kids can start producing farm-fresh foodstuffs like eggs, honey, salad, milk, fruits and bread for customers at the farm store. 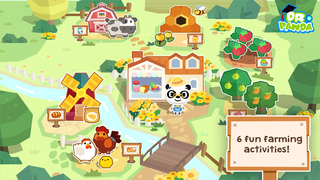 There are many activities to be unlocked in Dr.Panda Farm such as Honey Farm, Fruit Farm, Dairy Farm, Chicken Farm and Vegetable Patch. 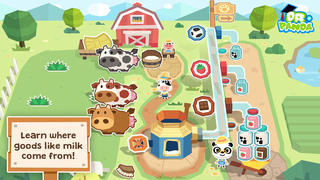 If your child loves animals and farm games, Dr. Panda Farm will delight them for hours on end. 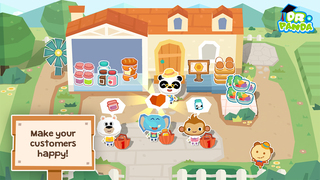 Understanding where food comes from is an important aspect to kids' health and community awareness, so it's really neat to follow the process from the beginning to the final product in the Panda store. 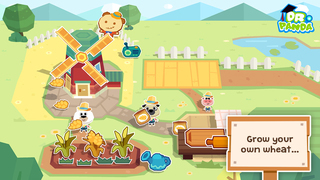 Overall, however, the graphics are fun, the games give a good general sense of farm practices, and kids can enjoy running the farmer's market. Fun and easy to play. Simply touch and tap – Perfect for people of all ages!